The Handwriting Learning Journey is a course of over 200 worksheets that will take your child from the first stages of writing – known as patterning – right through to being able to write in a fluent, joined-up style. Handwriting is an essential skill, but we all have to learn it, and it’s a very complex task. Legible, neat handwriting takes lots of practice and it isn’t just learning the alphabet – fine motor skills, hand eye co-ordination and an interest in putting pen to paper are essential as your child develops their skills. The final goal is for handwriting to become an automatic skill, so your child can concentrate on what, and not how, they are writing. Don't forget! We have a whole section of the site about handwriting where you'll find lots more information, including articles, worksheets and games. Your child's handwriting Learning Journey begins with patterning, which will help your child practise push pattern movements, pull pattern movements, vertical pattern movements, diagonal pattern movements and ‘c’ pattern movements (and is great fun!). Letter formation is next. Our worksheets divide the letters of the alphabet into ‘movement groups’ according to the movement made to start writing the letter. Each group has a lead letter – L for Long ladder letters, C for Curly caterpillar letters, R for One-armed robot letters and Z for Zig-zag monster letters. Once your child is ready to move on to cursive (joined-up) writing, our worksheets teach the process of joining, first using patterning and then using letters, words and sentences. Every child is different, and not all children will need to work through every single worksheet, but you should aim to print out some worksheets from each section, including the last ones of each group of patterns, before moving on to the worksheets practising joined-up words. Please note that the cursive patterning worksheets don't include all the letters of the alphabet, but the movements needed for each letter to follow another letter will have been practised. Some of our handwriting worksheets are quite long, but it is not necessary to complete a whole worksheet at a single sitting; in fact, short periods of concentrated handwriting practice tend to be more effective than long sessions when children can become tired and stop thinking about what they are doing. The way handwriting is taught varies hugely from school to school and different shapes are used for some letters ('b', 'f', 'g', 'j', 'y' and 'k' are the commonest letters with variations). For example, 'y' can be taught as a curvy letter (like a 'u' with a tail) or as a straight-lined letter (where the letter is made up of diagonal strokes only). It’s important for your child to practise their school style at home; always check your school’s handwriting policy and ask to see an example alphabet so you can help your child practise letters the same way at home and at school. For more advice about handwriting and how it's taught in school read our handwriting practice guidance. Need more information? Read our aticles to find out how children learn to write, try some great handwriting practice activities, establish good handwriting habits, solve some common handwriting problems, encourage reluctant writers and find out about dysgraphia. Don't forget to download Improve your child's handwriting in 8 weeks for tips on how to improve your child's manual dexterity, solve common handwriting problems and establish great handwriting habits. Before children are able to start writing letters and words their hands and muscles need to get used to producing marks on paper. Our Patterns playbook offers your child the opportunity to practise common writing patterns in preparation for handwriting letters at age 4 or 5. It's also a fun way to encourage an older child has trouble writing particular letters. Want to give your child some specific words to practise (their weekly spelling-test list, for example?)? 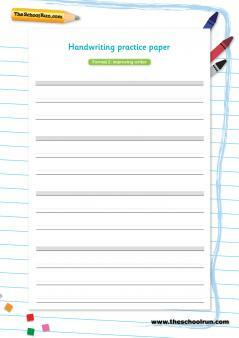 Print out our blank handwriting practice paper to offer them a new-writer-friendly format, with guide lines and shaded areas to help them form letters at the correct size.